The rum has been infusing for around 5 weeks now and I must say, the smell is still very…. rum like. You know the potent whiff that makes you kind of gag a little? That’s what it does! BUT when you add a nice measure to some lemonade it is absolutely delicious. The mulled spice takes an edge off the potency of the dark rum and with lemonade it kind of taste a bit like Cream Soda. I’ve no idea how that even WORKS but it’s not the same as dark rum with lemonade usually tastes. It comes across a little more vanilla-ry and warming. Yummy. I’ve been eyeing up a few other alcohols to infuse and definitely want to try something like a mango infused vodka or gin, I think that would be most delicious! And so simple to do. 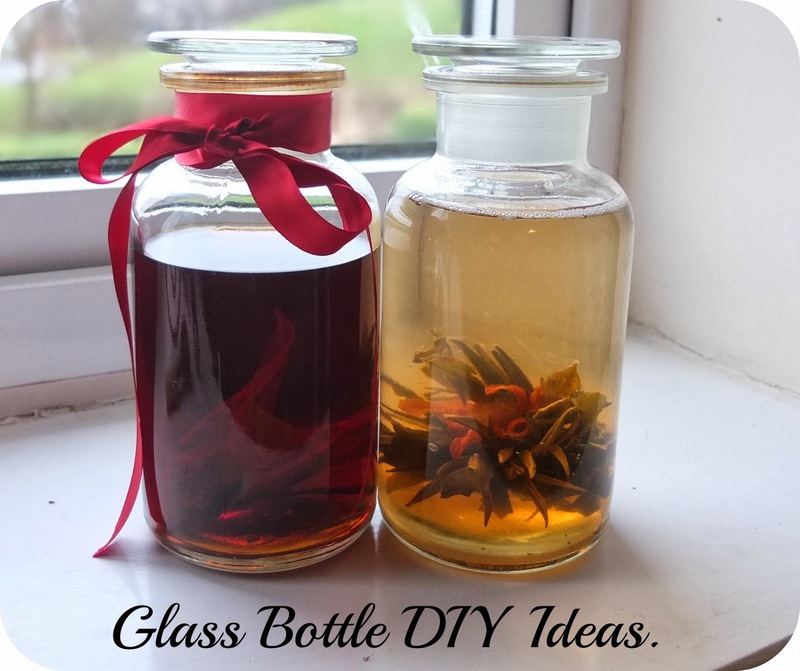 Infusing alcohol is a really good idea if you fancy a splendid drink on a budget as you can just slosh any old cheapo spirit in as a base and add whichever flavours you like. 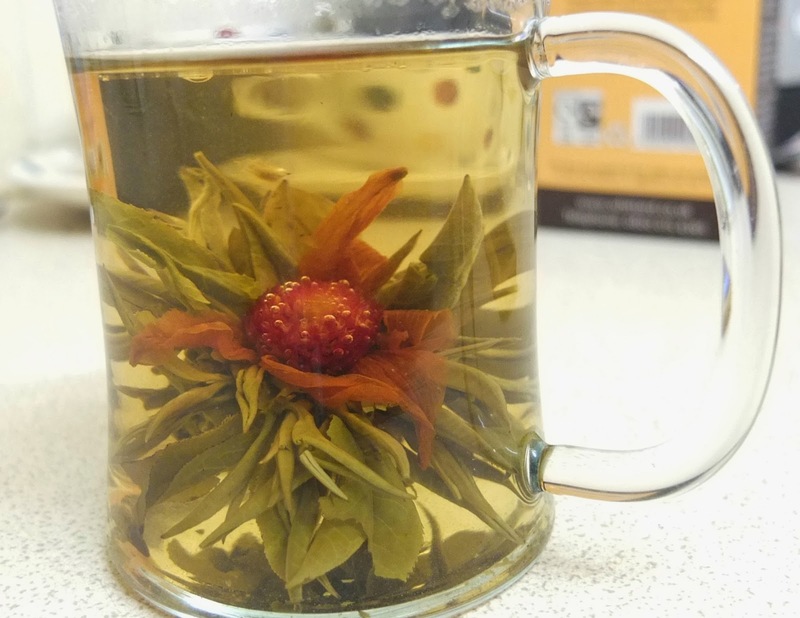 In the other bottle I decided to pop in an already flowered flowering tea (bag). I bought some of these from a chinese herbal store in Camden when I visited London a few months ago. I was forever eyeing them up but they come in a little pricey and I think 4 of them cost me around £5. I had NO idea what flavours I bought, or what they did/tasted like, flowered in to. It was a mystery. I could of actually bought balls of grass for all I knew haha. But alas, I waited forever to actually try one as I didn’t have a glass mug to watch the flowering action take place. I bought 3 for 99p on a recent trip to Home Bargains though and finallllyyyy got to have one. I did instagram a little video of it ‘brewing’ and it does look a little bit like pond life. The flower isn’t as pretty as I’d have hoped but I shoved it in the glass jar regardless. This is definitely just a temporary decoration though as the water soon becomes murky and a bit gross. But it looks kind of pretty in the meantime. My next plan for my jars/bottles is to infuse some olive oil in one. I think a sprig of rosemary would go down a treat in one of these and would be great for cooking with. Jamie Oliver reckons that’s a good idea anyway on that TV show he does. By the way, the tea also tasted as much like pond life as it looked. I’ve no idea what flavour it was meant to be! Baldwins do a brilliant range of Natural and Herbal products, so if these glass bottles aren’t your bag then check out what other products they do here.